Ryan arrives home from the library. Dorothy wants to talk to him about the sedatives. He plays it down saying it was only a couple of pills, but Dorothy says it can lead on to bigger things. Ryan is very defensive, saying Dorothy doesn't think he's responsible. Dorothy says it's hardly responsible to take sedatives on Adam Willis's advice, but Ryan explains that it had nothing to do with Adam - he got the sedatives from Dr Dawson. Dorothy is takenaback. The Willises are speechless - the police have raided their house and taken away some of Adam's medical equipment. Apparently they were jars of formaldahide and chloroform, and some glucose powder. DOUG: What gave them the idea that you were some kind of drug lord?! ADAM: Beats me, but Gemma had the same idea - she thought I'd told Ryan to take sedatives! DOUG: You didn't, did you? Pam wants to go and sort Dorothy out, but Adam says he'll handle it in his own way. ADAM: The mood you two are in, we'll have the cops back to haul you away for murder. DOUG: It wouldn't come to that. Manslaughter? Pam vows that Dorothy won't get away with this. Joe reminds Toby of his promise to take Bouncer for a walk every day. There's a knock at the door and it's Eric returning Sky. Apparently they had a barbecue and Sky enjoyed themselves. Joe and Eric get on quite well and in conversation Eric tells Joe that he's going overseas for a few weeks. ERIC: My solicitor will let you know about the new arrangements. He makes a sharp exit, leaving Joe confused, but he is distracted by welcoming Sky home. Adam answers the door to Dorothy. She's come to apologise. 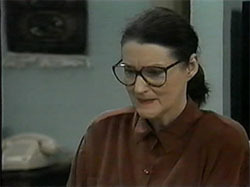 Adam informs her that the police have just left, having ransacked his room and impounded his medical surprise. Dorothy said she didn't make a complaint, she just had an informal chat with Sergeant Moody. She apologises profusely to Adam and says she'll apologise to Pam and Doug too. Harold is berating Madge for sacking Matt - she's just made things worse. 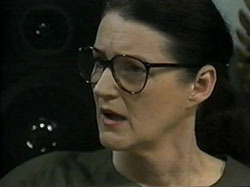 Helen comes to the door to find out why Madge hasn't turned up to dinner - Madge has forgotten! 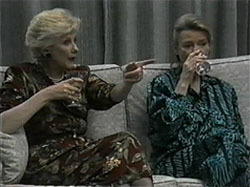 Madge doesn't think she'd be very good company at a dinner party, but Helen and Harold talk her into it. MADGE: You know, you'd think I'd have learnt my lesson after Scott and Charlene. MADGE: By pulling Gemma and Matt apart all I'm doing is pushing them closer together. HELEN: If they turn out like scott and Charlene, you can relax! Adam and Caroline are hugging in the kitchen and talking about Dorothy. They open a bottle of wine and Adam apologises for not having the money to take Caroline out. He looks rather fed up. There's a knock at the door and it's Adam's mate Rory. He is under the impression that Adam invited him to dinner with him and Caroline. They reluctantly invite him to join them. He sits down and asks when they can introduce him to Christina! Harold pops around to return Sky's little dog toy. Joe tells him that things are looking up - Eric is going overseas and alternative arrangements are going to be made. Harold advises Joe to ring his solicitor straightaway in case something is brewing. Joe looks worried. JOE: I'm sick of this! Pam, Doug, Madge, Harold, Helen and Doug are chatting in the living room. 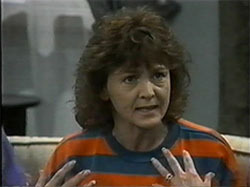 Pam is telling the assembled gathering about Dorothy reporting Adam for dealing drugs! 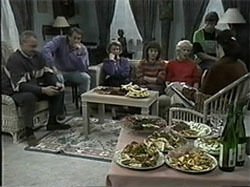 Pam suggests that they all boycott the next Neighbourhood Watch meeting, but Helen and Harold are the voice of reason. Adam, Caroline and Rory are playing Scrabble. Rory is making lewd comments and Caroline suggests that he goes back to work. If he does, she'll talk to Christina about him. Rory is pleased and heads off. Madge and Harold arrive home from Helen's place. Madge is still fed up with Dorothy and senses battles ahead! Dorothy talks to Ryan again about his sedatives. He is very hostile. Dorothy apologises for putting him under so much pressure with his schoolwork. She only wants him to do his best. Ryan says that the whole family are putting pressure on him - they all expect straight As and he's not capable of delivering. He stalks off to his room. Adam is telling Pam and Doug that Dorothy came over to apologise last night. Pam is unmoved and says Dorothy will be sorry she ever started on their family. Dorothy is setting up for the Neighbourhood Watch meeting. She asks Ryan if they can be friends again, but he is interrupted by a knock at the door. Helen, Madge and Jim come in. Apparently the twins aren't available and the Willises might not be coming. But just then Pam and Doug arrive. They've forgotten that the meeting was on and awkwardly join the group. Caroline answers the door to Rory. He says he left his wallet behind and then makes a pass at Caroline, trying to kiss her. She's not impressed, but Rory explains that he thought she was Christina. She is not impressed. Joe is loading up the ute. 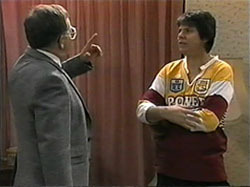 He tells Harold that he's phoned his solicitor - Eric isn't going on a trip, he's going to live permanently in New Zealand. If he wins the case, Sky will go with him. Also, he wants to bring the hearing forward. Harold looks stricken and Joe looks gutted too. Dorothy is telling Doug off for not doing enough to rectify the problem areas of the house that they identified in the last meeting. Doug protests that he has a business to run but Dorothy says that's just an excuse(!) Madge is told off for not putting her outside light on three nights this week and Jim and Doug have also wasted police time by playing pranks on each other. PAM: You've got a nerve, accusing Doug of wasting police time! PAM: You heard! What do you think you've been doing?! Slandering Adam, getting us raided! I mean, Adam is very upset. DOUG: We all are, Dorothy! PAM: Doug's upset, I'm upset. I mean, it takes a lot to get me riled, Dorothy, but you've done it! PAM: Oh, you know what you can do with your 'explanations'! I mean, you go rushing into something you know nothing about, you disrupt the lives of everyone around you, friends, neighbours, even your own flesh and blood! I'm just fed up with your attitude, Dorothy, it's really time you woke up to yourself! MADGE: Music to my ears. Finally someone has said what the rest of us have been bottling up for ages. And on that note, I'm off. But there isn't really anything left to say.